The total production in Urengoyskoye field of the company “Gazprom dobycha Urengoy” reached gigantic figures – 7 trillion cubic meters of natural gas. This is the world record on extraction of one enterprise from subsoil of one extractive field. On the 25th of March a representative of the Russian book of records came to the central control room to record the production achievement. Representatives of the management board, veterans and young specialists of the company were present. Also journalists of federal and regional mass media were invited to the event. 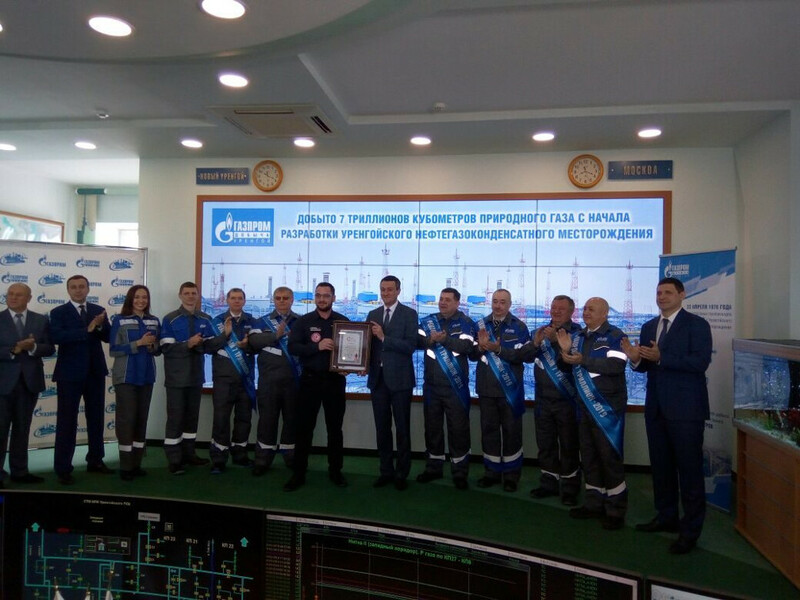 The representative of the Russian book of records Alexander Peresvet gave the certificate to the deputy director general for production of “Gazprom dobycha Urengoy” Rustam Ismagilov. Last year “Gazprom dobycha Urengoy” celebrated the 40th anniversary since the beginning of extraction. The country received the first gas from Urengoyskoye field on the 22nd of April, 1978. The first milliard cubic meters was extracted just a month after that. The enterprise registered the first gas trillion in April of 1986; the next trillionth achievements fell on 1989, 1993, 1997 and 2001. By the end of 2008 the total extraction from Urengoyskoye field made 6 trillion. In September of 2009 “Gazprom dobycha Urengoy” entered the Russian book of records for the largest amount of gas extracted from one field. Urengoyskoye oil, gas, condensate field is truly gigantic both in reserves and in size. Its length from the north to the south is about 250 kilometers, and the area is about 6 thousand square kilometers. Gas, oil and gas condensate are extracted from subsoil of the field.